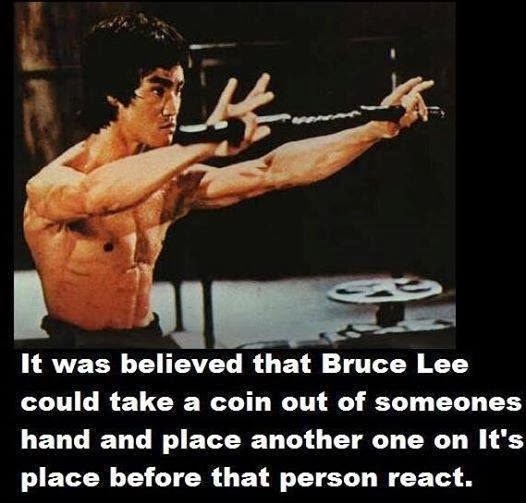 Bruce Lee, Chinese name Li Jun Fan (born Nov. 27, 1940, San Francisco, Calif., U.S.—died July 20, 1973, Hong Kong), American-born film actor who was renowned for his martial arts prowess and who helped popularize martial arts movies in the 1970s. Lee was born in San Francisco, but he grew up in Hong Kong. He was introduced to theentertainment industry at an early age, as his father was an opera singer and part-time actor. The younger Lee began appearing in films as a child and was frequently cast as a juvenile delinquent or street urchin. As a teenager, he took up with local gangs and began learning kung fu in order to better defend himself. At this time he also started dance lessons, which further refined his footwork and balance; in 1958 Lee won the Hong Kong cha-cha championship. In 1939 Lee's father, a popular Chinese opera star, brought his wife and three children with him from Hong Kong to San Francisco while he toured the United States as a performer. At the end of the following year, on November 27, 1940, another son was born to the Lees. In accordance with Chinese tradition, they had not named him, as his father was away in New York; therefore the mother took the advice of her physician and called the boy Bruce because it meant "strong one" in Gaelic. Lee reportedly had a number of Chinese names, but it would be by the name of Bruce that he would become famous. Stardom began early, with his first film appearance at age three months in a movie called Golden Gate Girl.By then it was 1941, and though their native Hong Kong was occupied by Japanese troops, the Lees decided to return home. According to Chinese superstition, demons sometimes try to steal male children. Out of fear for the young boy's safety, they dressed him as a girl, and even made him attend a girl's school for a while. Meanwhile Lee grew up around the cinema, and appeared in a Hong Kong movie when he was four. Two years later, a director recognized his star quality and put him in another film. By the time he graduated from high school, Lee had appeared in some twenty films. As a teenager, he became involved in two seemingly contradictory activities: gang warfare and dance. As a dancer he won a cha-cha championship, and as a gang member he risked death on the streets of Hong Kong. Out of fear that he might be caught at some point without his gang, helpless before a group of rivals, Lee began to study the Chinese martial arts of kung fu. The style that attracted his attention was called wing chun, which according to legend was developed by a woman named Yim Wing Chun, who improved on the techniques of a Shaolin Buddhist nun. Lee absorbed the style, and began adding his own improvements. This proved too much for the wing chun masters, who excommunicated him from the school.